Check the official product page for a detailed tutorial overview. In the first chapter you will learn sculpting techniques and how to use the sculpt mode tools, settings and brushes. Additionally, you will learn how to create base meshes, how to solve common sculpting problems and how to use the Sculpt Tools and SpeedSculpt add-ons. After you’ve made your way through this chapter, you will have a basic understanding of Blender’s sculpting tools and how to use them properly. You can come back to this chapter any time you need to brush up on your basic skills. In the second chapter you will learn how to sculpt a small monster from scratch. This chapter is suitable for beginners, since nearly everything is sculpted in realtime and fully commentated. Starting with a cube you will create a base mesh based on a concept drawing. After that you will add all the details using Blender’s sculpt mode. Throughout the process you will learn how to use the sculpting brushes for Dynamic Topology sculpting, how to merge different objects, how to pose a sculpting and how to create custom brush textures. In the third chapter you will learn how to sculpt a complex creature from scratch. This exercise is suitable for advanced users. Here you will learn about the full potential of Blender’s sculpt mode. 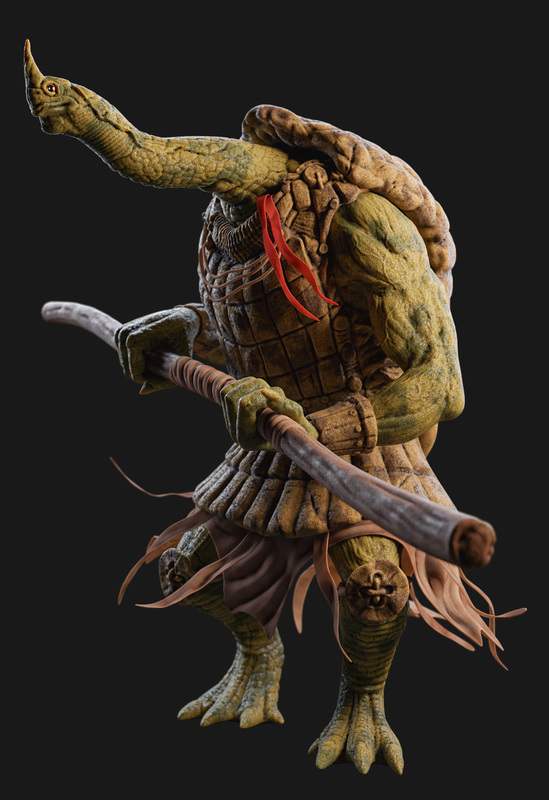 You will be taught how to create a base mesh, sculpt important shapes, add separate scales to the creature, create custom brushes, optimize the mesh using Instant Meshes, pose the creature and much more. In this exercise you will use Dynamic Topology once more. In the fourth and final chapter you will discover procedural shading techniques and how to light up and render your scene. Since this course uses exclusively Dynamic Topology to create sculptings, you will have a sculpting with many polygons and bad topology in the end. In order to do a quick but nice rendering without spending hours on retopology and UV mapping, you may use quickly generated textures (procedural textures), which you will be able to map onto the sculpting without visible seams. In this chapter you will get an introduction to procedural shading, lighting, rendering, camera animation and you will create a procedural clay shader from scratch. 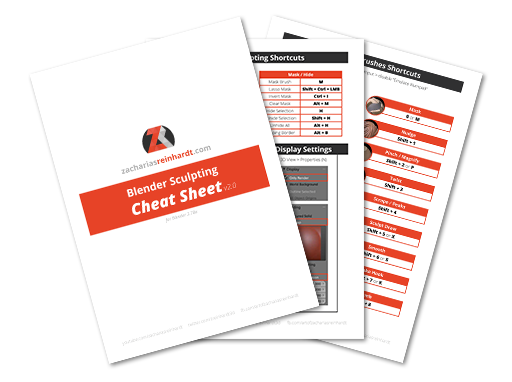 All sculpting shortcuts in one place! To speed up your sculpting process, you should learn the brush shortcuts. This print-ready shortcut overview is a perfect helper to quickly learn all of the important shortcuts. Print it out and put it on your wall! All important project files are included, like Blender 3d files, concept art and shaders. Additionally, two concept art timelapses are included (cute monster and creature). 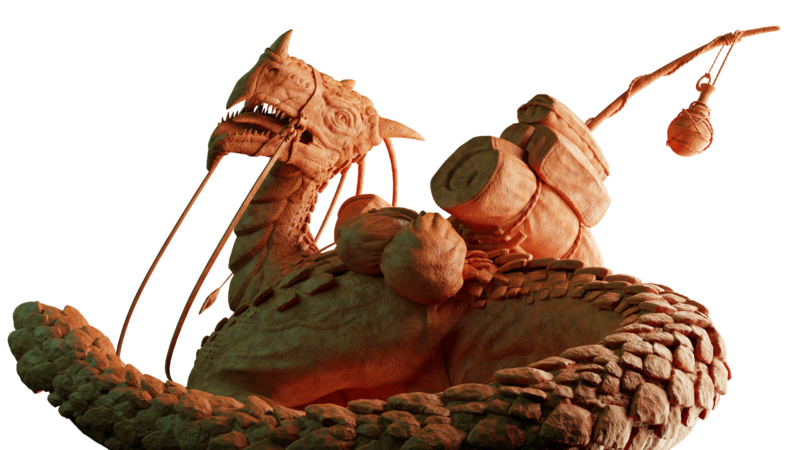 Update 01: A commented timelapse and the project files of a turtle sculpting were added. The timelapse is also available for free, here. Instructions: Download all Zip archives and unpack them using a tool like 7-Zip. Watch the video called "0-01 Start" first, to get an idea how to use this workshop. To get a detailed overview about the workshop, open the PDF file called "Mastering Sculpting - Content Overview". Please note: If you have problems with the video playback, please try the free VLC media player. Do I learn human anatomy in this course? No. We will focus on the tools and workflows, and we will sculpt two creatures from scratch in this course. Do I need a strong computer for sculpting? To have fun while sculpting (we will work with many polygones) a decent computer is recommended. I’m using a Windows 10 PC with 32 GB RAM, an Intel Core i7-7700K CPU and a NVIDEA GeForce GTX 1080 Ti graphics card. Do I need a graphics tablet for this course? A graphics tablet is recommended, because sculpting with a mouse is not much fun (although it’s possible). A graphics tablet in any size is fine. I’m using a Wacom Intous Pro M.
Is it suitable for beginners (or advanced users)? Yes! This workshop is suitable for both sculpting beginners and advanced users. However, you need to know the fundamentals of Blender, since this course is not a general introduction to the software. If you are new to Blender, start here. 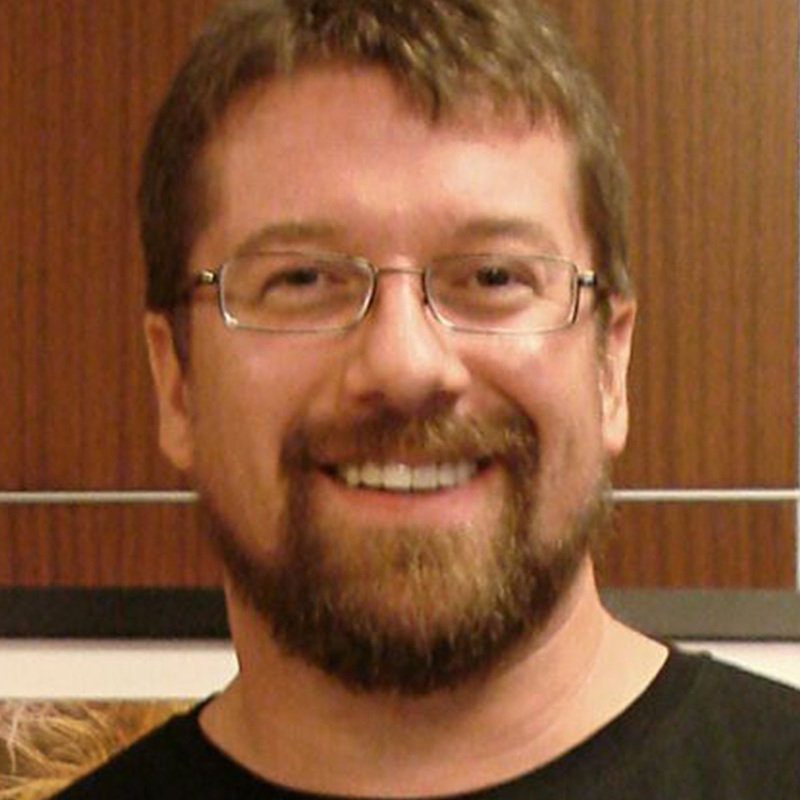 This is a great course to learn dynamic topology sculpting. There are a lot of useful tips to improve sculpting skills and workflow. The chapter about procedural shading is very useful. This is a must-have course! This is exactly what I needed to take the next step in Blender. If you've done basic modeling through tutorials like Blender Guru's donut and anvil series, and you are looking to take a deep dive into Blender sculpting and advanced features, this course is for you! Zach does a great job of breaking down complex concepts. He shows you how to leverage free and paid add-ons, and he also shows you how to do without them in case you want to use default Blender settings. I highly recommend this course, and I was quite impressed with his teaching capabilities as well as his artistic capabilities.